Penny Western goes on at 8PM Sharp! 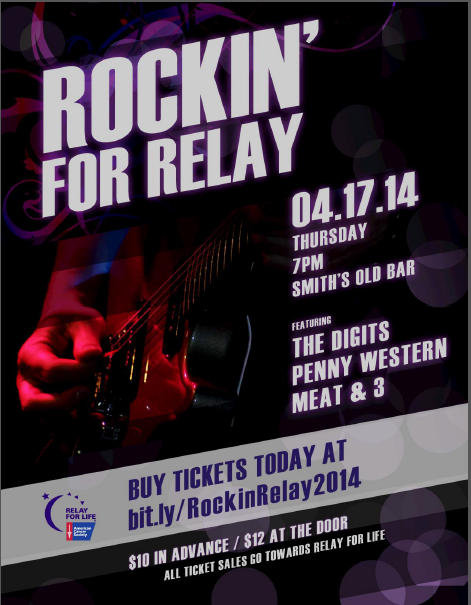 Please join us for a very special show at Smith’s Olde Bar onThursday, April 17 to benefit the American Cancer Society’s Relay for Life. Be there early (or at least on time), as PW starts at 8PM sharp. We’ll be teaming up with our friends The Digits, an amazing band who can cover everything from Zeppelin to Jane’s Addiction to Journey. As it happens, both of our bands boast a cancer survivor, so we can tell you from experience how important advancing cancer research is.